Industrial Bio-Star is the industrial version of our standard Bio-Star, which is full of unmatchable features that you are looking for. It comes in a new and improved style with larger graphics LCD display to show the information of the employee. It has more than 5 lacs recording capacity with up to 9560 fingerprint templates storage capacity. The Industrial Bio-Star is designed to be installed in any industry or factory to manage the attendance records of employees. The software linked with this device easily grabs the data and helps to keep an updated record. The Industrial Bio-Star is featured with audio message in English or Hindi (as per you select) and visual message through two LED lights to confirm the punching status. In fact any other customized messages can be loaded from end user. 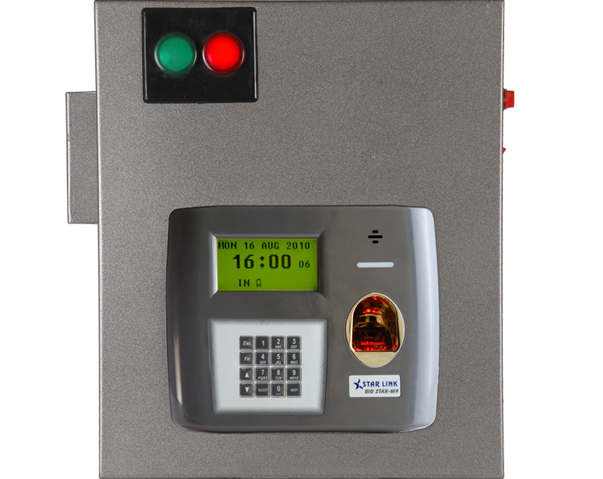 The Industrial Bio-Star runs on multiple operational modes like finger print, card or PIN etc. This device can be connected through built-in TCP/IP over Ethernet & USB port for data transfer. This device comes with heavy metallic body for industrial purposes and in-built battery for 48 hours battery back-up. Also, the Industrial Bio-Star can be customized according to your requirements. Audio Indicator: Voice Guided message (Adjustable volume) / voice message in other language (at extra cost)/ Customized voice greeting (at extra cost). Time Attendances, Access Control, Payroll, Canteen, Visitor Mgt.